Anemone (Pulsatilla) patens. A large patch growing in the Rocky Mountains. 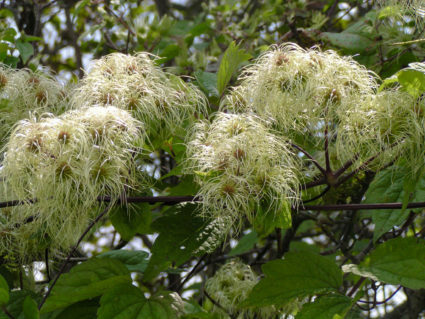 It is the plant with the feathery tops. An Anemone (Pulsatilla) patens plant showing the feathery infructescence. Plant growing in the Rocky Mountains. Anemone is a genus of beautiful flowering plants growing in various regions of the United States and other parts of the world. 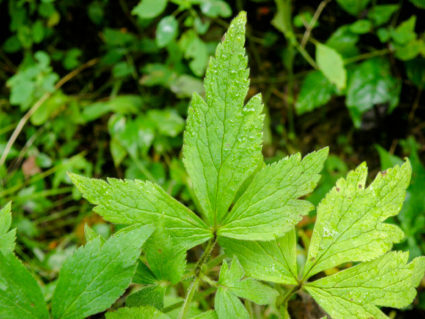 It is an unusual plant in its very specific and useful medicinal properties. The main use discussed here is its value in helping alleviate panic attacks. This is a brief overview of this potentially debilitating disorder. Panic attacks are also called anxiety attacks. These are a common health problem affecting the physical, mental and emotional aspects of a person’s nervous system. They are complex in their cause and treatment. While the symptoms are different for different people, they typically come on suddenly and flood the person with feelings of fear, dread, anxiety and panic. Breathing may become difficult and the heart may race. It can incapacitate a person’s ability to think or act. The physiology of these events is poorly understood. While the panic attack may come on suddenly and end abruptly, the person affected is often left feeling shaken and scared, including the fear of further episodes. This can lead to a feedback loop where the fear of further attacks can prime the body for further incidents. Some panic attacks have apparent triggers while others do not. Anemone hupehensis (Chinese anemone). Chelsea Physic Garden, London, England. There are approximately 25 species of Anemone growing in the US. Many people often associate Anemone with the sea anemone. It can be helpful to make the distinction and let them know it is a plant rather than an animal. 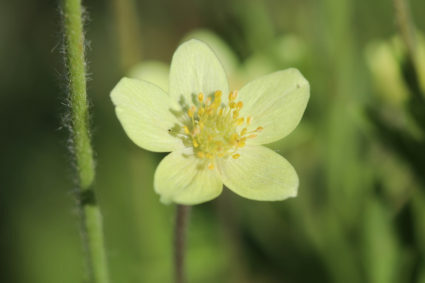 Also people recognize the name Pulsatilla from its use in homeopathy. 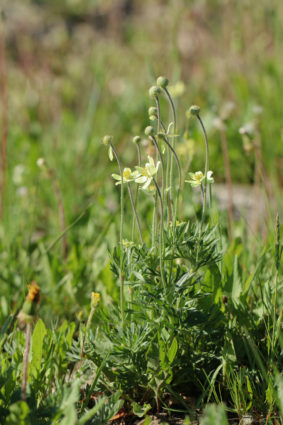 It is a member of the Buttercup family (Ranunculaceae). 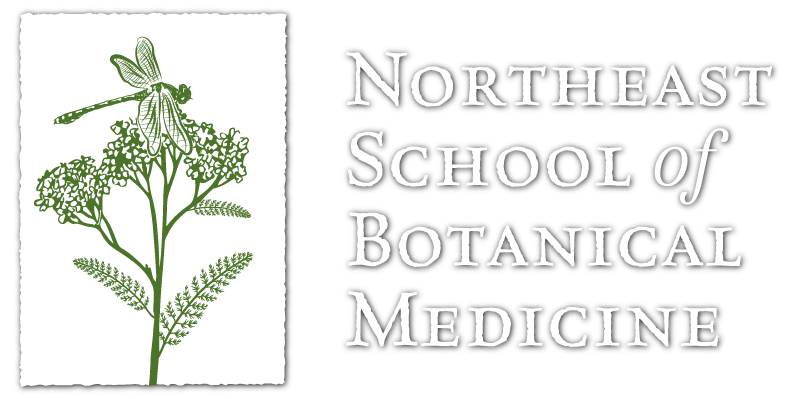 This family contains a number of alkaloid-rich medicinal plants including Black cohosh (Actaea racemosa), Oregon graperoot (Berberis spp.) as well as some poisonous species. The taxonomy of Anemone is in a bit of disarray, especially between the genera Anemone, Pulsatilla and Hepatica. 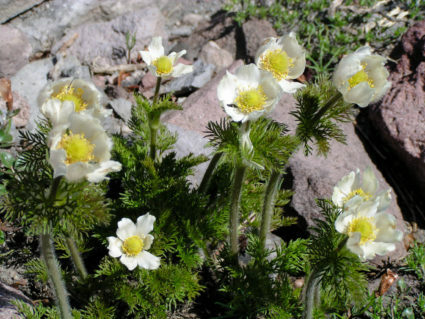 The genera Pulsatilla and Anemone are classified differently depending on the source. The flowers are bisexual and occur in many colors including white, purple, blue, green, yellow, pink and red. 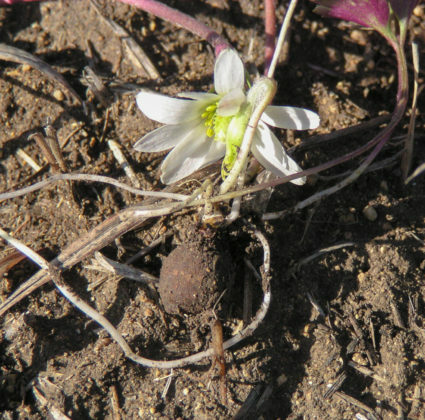 The petals are generally absent and replaced with petal-like sepals. There are numerous stamens and ovaries. The fruits are achenes, and are numerous and crowded on a common receptacle. 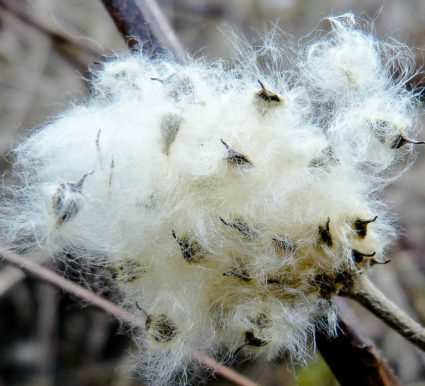 On many species the seed is attached to some cottony fluff. 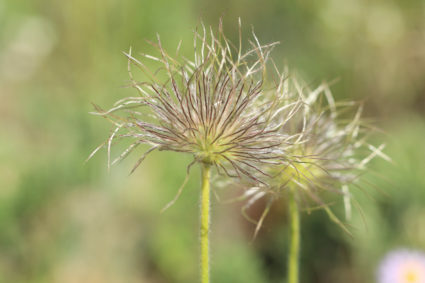 This is the pappus and helps the seed with wind dispersal (like a Dandelion). 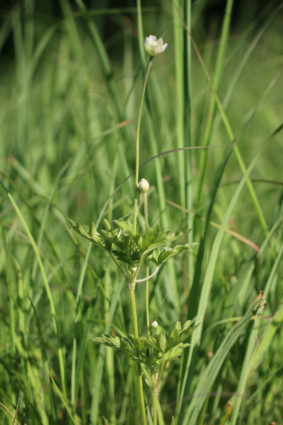 There is often a leaf-like involucre subtending the inflorescence. There are a few types of underground structures including woody roots, tubers, and rhizomes. Anemone virginiana showing the pappus that helps with seed dispersal. New York. 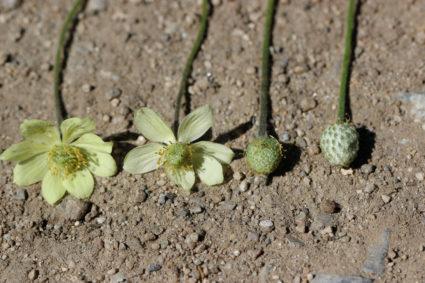 The various flowering stages of Anemone multifida (Pacific anemone). Rocky Mountains. Anemone multifida flower. Note the many stamens and pistils in the middle of the flower. Rocky Mountains. The achenes of Anemone canadensis (Canadian anemone). Upper penninsula, Michigan. 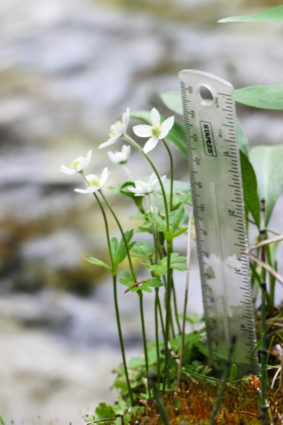 There are numerous species of Anemone found in various regions of the US. I mainly use the species I initially found beneficial. 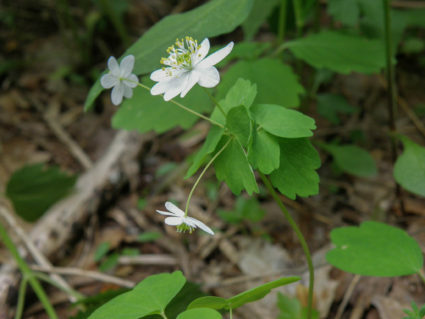 I have not tried the eastern species or similar genera such as Anemonella or the former Hepatica. Below are the 3 species I have used most often for medicine. There is a lot of room for experimentation with the various species (see Safety Guidelines). I use taste as my main criteria to test for the potency of a species. I am not sure if this is an effective way of gauging medicinal action, but the species I use taste very acrid. 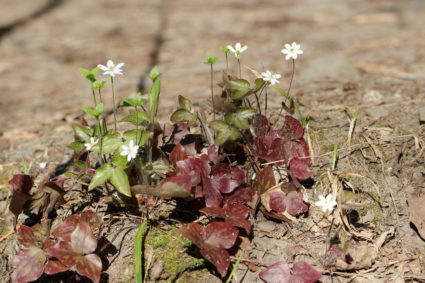 Anemone (Hepatica) acutiloba. 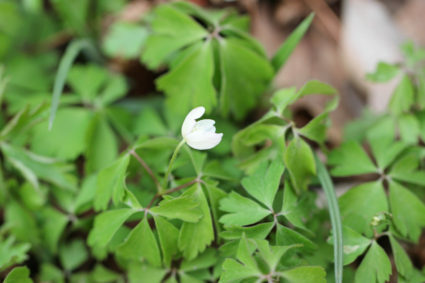 Note how the sepals are less leaf-like than other Anemones. 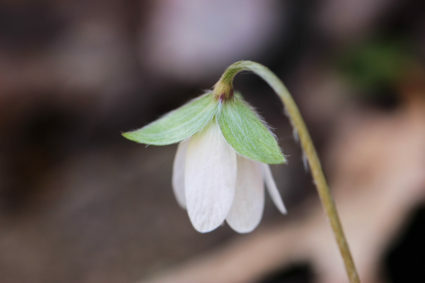 Anemone quinquefolium (Wood anemone). Ithaca, New York. 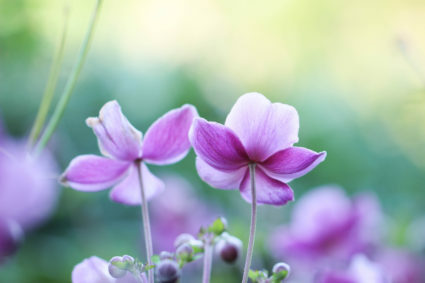 Anemones are perennial herbaceous plants with a variety of underground structures. 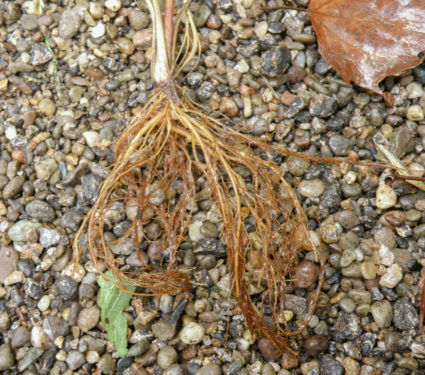 A quick botanical note: while it is common to call all underground structures roots, they are as variable in form and function as the aboveground parts. Potatoes and onions are good examples of this. The underground structures of Anemone are the parts that I find the most medicinally active. They are usually tubers (think of very small potato) and woody taproots (picture a woody carrot). Because I use these underground structures, it is even more important to be conscientious of how much one gathers (see Wildcrafting Anemone). I have begun using the leaves and if they work well I will likely switch to them. Anemona (Pulsatilla) patens (Cutleaf anemone) woody roots. Rocky Mountains. Anemone (Pulsatilla) occidentalis (Mountain pasqueflower) woody roots. California. Anemone tuberosa tubers. New Mexico. Anemone virginiana fibrous roots. Ohio. There are conflicting reports on the safety of Anemone. As with other medicines, please use your personal judgment when using plant-based medicines. This discussion on safety is based on my personal experience along with the experiences of herbal peers. I have been using Anemone for many years. In my experience it is a safe plant except when preparing it for medicine (see below). The two most common medicinal problems I see are 1) that is does not help at all, and 2) in some people it ‘flattens’ their personality for a short while. This may show up as reducing their sense of humor or ennui. I see this most commonly with people who try it and are not prone to panic attacks, but they want to experiment with Anemone. 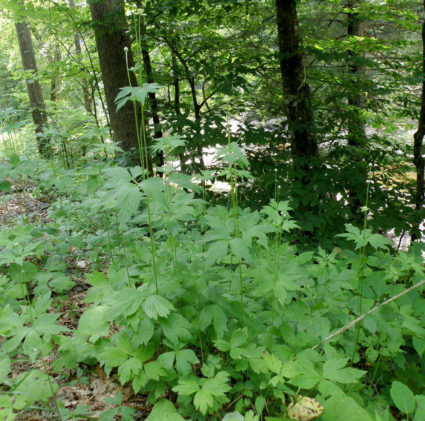 Some sources list it as potentially poisonous and its use is restricted for herbalists in some places. I have used Anemone in a wide range of dosages for many years and do not see a reason for this concern. Again, individuals will have individual reactions. I have also given it to people to use in low dosages on a regular basis and have not seen any negative results. While I encourage people experimenting with other genera and species, one should be cautious and stay observant for any untoward negative responses. Clematis virginiana (Virgins bower) in fruit. Ithaca, New York. Wildcrafting is the gathering of plants where they are not purposely planted (see Wildcrafting Guidelines). While I like to encourage people to gather their own plants for medicines, there are a number of practical ethical and environmental concerns with wildcrafting. 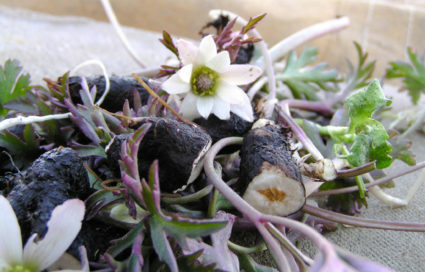 This is even more complicated when gathering native plants such as Anemone and especially when digging up their underground structures. 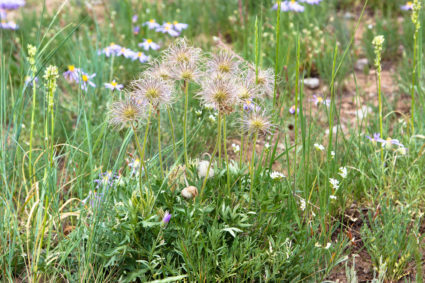 Native plants should be gathered with a far-reaching outlook to their place in the environment. 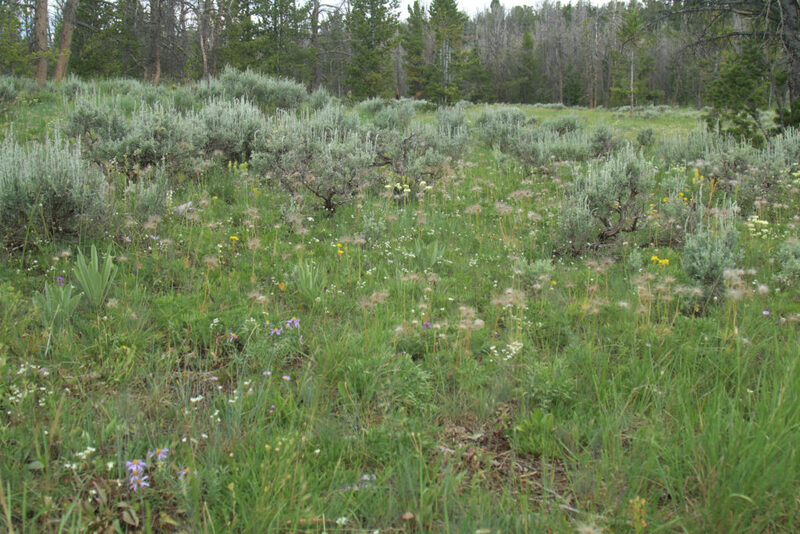 This is because non-native plants often have a competitive edge and can more easily colonize disturbed ground. Digging their roots and tubers adds to the problem as this leaves a place for non-natives to grow. 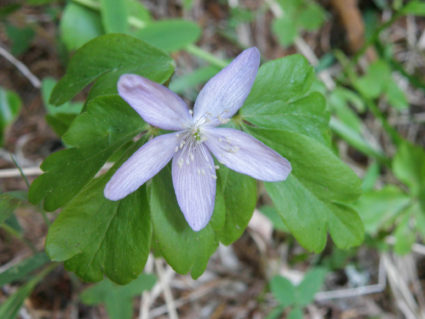 There are a number of Anemone species in various regions of the US (see Medicinal Species). 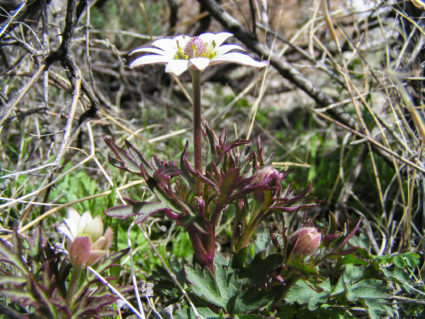 The species I most commonly wildcraft grow in the Rocky Mountains and Southwest. In the past I have only sparingly gathered these plants, as I did not find large stands. But a few years ago I came across an area with an abundance of plants and feel I can comfortably gather larger quantities. It is remote and unlikely to be disturbed by human development anytime soon. There are a number of Eastern species that I have only recently begun experimenting with. These often grow individually or in small patches and present a challenge to sustainable wildcrafting. 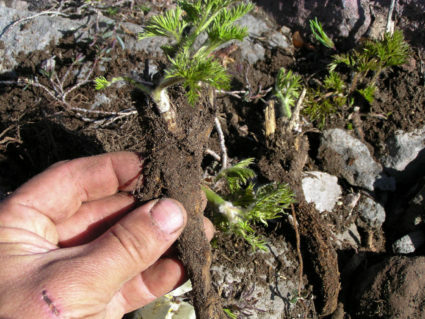 Pulsatilla vulgaris tincture, leaf and root. Oregon. I feel that Anemone works best as a fresh plant tincture. One of the main reasons is that the plants seem to lose most of their potency when dried. There are a few other menstruums that can be utilized as solvents such a glycerine, honey or vinegar. I have not used these in practice and don’t know if they extract the medicinal compounds. When I wildcraft Anemone, I bring all my medicine making supplies so that I can prepare it within a few hours of gathering them. I mainly use the underground structures, which are generally tubers and woody roots. I feel these contain the strongest medicinal activity. It is important to note that having the ‘strongest’ medicine is not always necessary. But for my work doing first aid, I like to carry potent medicinal preparations so that I can carry less on me as the dosage is smaller. I have tinctured fresh leaves as well. I have not used them yet and don’t know their medicinal quality. 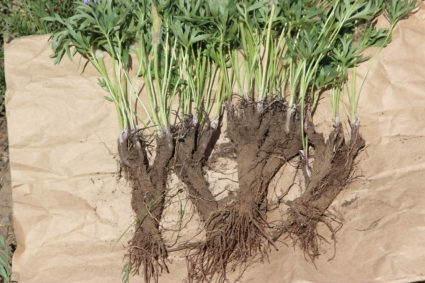 But from their acridity, I feel they may also process some of the same properties as the roots and tubers. Warning-if blending the fresh plant in a blender, keep your face away from the fumes, they can be caustic. Or at least use good ventilation such as a fan. One time I was blending the fresh leaves in my home and it felt like I had a first-degree burn on my hand, my nose was dramatically draining, my eyes were burning, and I was a bit nauseous. This is very uncommon for me when processing plants. This can also happen to a lesser degree when chopping the plant in close quarters. I have not had this happen from touching the plant, only when the fumes are released while chopping or blending. Chop or blend the fresh tubers or roots. Note the warning above. Tincture at 1:2 in 95% ethanol. Chop or blend fresh leaf and aboveground parts. Tincture at 1:4 in 95% ethanol. Anemone canadensis (Canadian Anemone). Upper peninsula, Michigan. Anemone Dosage Guidelines-Please see Safety Guidelines. 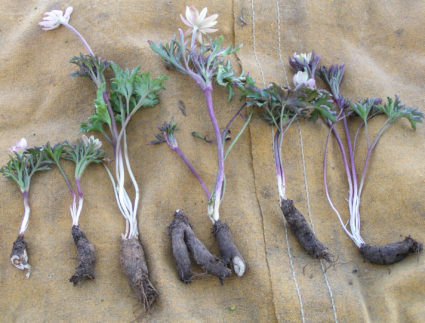 Dosaging with Anemone can seem complicated because it is considered a ‘low dose’ botanical. For some plants ‘low dose’ implies that one should only use a low dose of a preparation as larger doses may be poisonous or have negative effects. 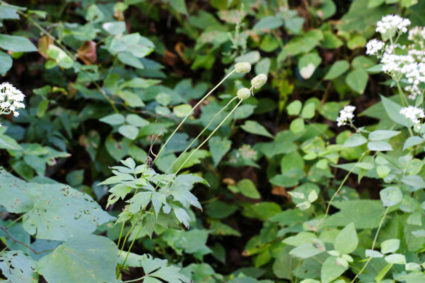 While I also consider Anemone a ‘low dose’ botanical it is because it is medicinally active at lower doses, but is safe at higher dosages as well. This information is based largely on my clinical experience. I work at a number of first aid clinics where I regularly use Anemone. In some instances I have used much higher dosages (a few dropperfuls), as the situation was more severe. In my experience, while larger doses do not cause any negative health effects, they do not work better than smaller doses. To clarify, I feel that Anemone is useful in low doses, but is not dangerous in large doses. But it may not be much more effective and hence makes more sense to use lower doses, especially as the plant and the tincture are not easy to come by. All the below recommendations are with the use of fresh plant tincture. 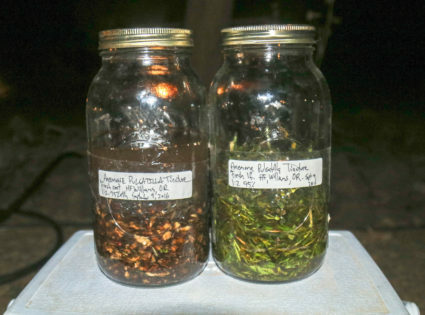 Before giving tinctures, always let people know that there is alcohol in the preparation. This is very important as some people are sober or may avoid alcohol for other reasons. Begin with 5-10 drops directly in the mouth. While this is a small amount it can often have an effect. Wait about 2-3 minutes and see/ask how it feels. When it works, one can usually tell within a short amount of time. They may feel a sense of relief, though this can be just a subtle change. Continue to use this amount until the panic attacks has passed or until they have gained as much benefit from the tincture as it looks like they will. The tincture may have to be taken 3-5 times in which they either feel better, or feel as good as this medicine is going to help. In this way of administering medicine, give the tincture until someone does not feel any improvement. This is the plateau dose, the beneficial amount the medicine will provide in that moment. 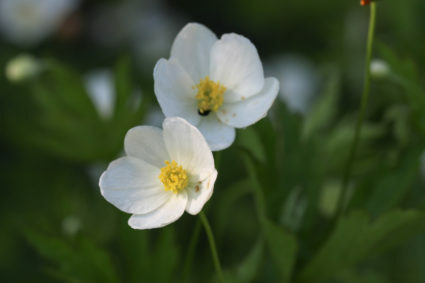 If the Anemone is for someone else, it is helpful to give them a small amount to take for later. This offers a sense of reassurance in case the feeling returns. Put approximately one dropperful (about 22 drops) in a 1 ounce bottle. They can take a capful or dropperful as often as needed. This can be altered for the amount they need and the amount you have to give away. Some people may need larger amounts. Once the amount is known, in future circumstances they can go directly to that dose. Anemone oregana (Western blue Anemone). Washington state. Anemone combines well with other plants and is especially helpful to include in formulas when there is continual background anxiety. 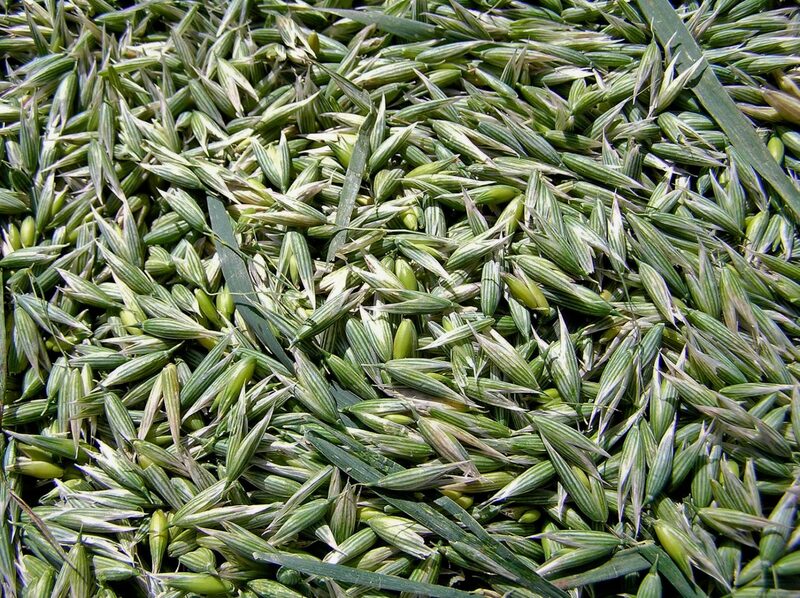 It combines well with Skullcap, Passionflower, Blue vervain, Damiana, Hops and other nervines and sedatives. It is often a small part of the formula, about 1/5 part or less. Triggers can include events, encounters, foods, chemicals and a wide variety of other sources. These can be highly individual. Panic attacks can be episodic, happening in clusters. Removing or reducing triggers may help decrease a series of attacks. Caffeine and other stimulant consumption can be possible triggers. Insomnia can contribute to lowering the threshold for triggers. It is helpful to recognize the first signs of panic attacks before they become disabling. This period between recognition of an imminent attack and the attack itself is a good time to use herbs, breathing, relaxation techniques or other ways to reduce the response. Using constitutional remedies that work with an individual’s health issues and other personal traits. Address individual health issues that are not directly related to the panic attacks. Use herbal nervine remedies on a regular basis such as Skullcap Passionflower, Blue vervain, Hawthorn, Motherwort, Rose, Tulsi and Lobelia (another low dose herb). 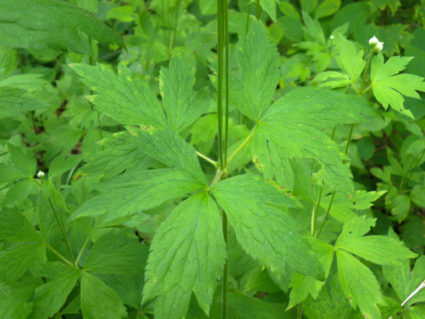 Using strong relaxing and sedative plants such as Hops or Valerian. These herbs can be taken in small amounts over a long period of time to help restore nervous system tone. Larger amounts can be taken before, during and post anxiety attack. Trying different health modalities such as acupuncture, massage therapy, or counseling. The main way I use Anemone is for panic attacks and in formulas for long-term anxiety. Another place I have found it useful is for people having difficult psychedelic experiences from recreational drugs. While it works less often in this capacity, it is worthwhile trying along with other harm reduction approaches. It can be difficult to get someone to take it in these situations and should be administered by people knowledgeable in working in these conditions. The dosage is the same as for panic attacks. Wildcrafting is the skill of gathering plants where they are not previously planted. This includes wild, rural and urban areas. Humans have an extensive history of gathering plants for medicine, food and other uses. This is a time-honored tradition that still has a place in the modern world. But times have changed and we have to be much more considerate in gathering plants on this very populated and developed planet. When gathering plants, consider the whole ecology of an area. What could change from your gathering these plants? Consider the other plants and animals (including people) that use the area. Don’t be greedy. It often takes a lot of effort to find the plants one wants to gather and there is a strong temptation to gather as much as one can. Try to resist and consider the local sustainability of what you are gathering. Spend time finding your wildcrafting locations. There may be nearby stands of plants but further afield there may be more sustainable areas that fewer people visit. It can be helpful to not share some of your wildcrafting sites. This allows you the opportunity to see what changes occur from your wildcrafting when you go back. Bisexual flower-having both stamens (pollen producing) and ovaries (seed producing) parts in the same flower. 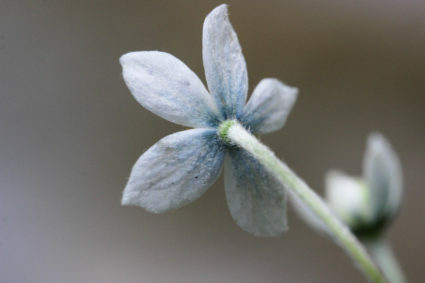 Ephemeral-plants that bloom quickly and then die back. Fruit-the mature ovary of a flower containing the seed(s). 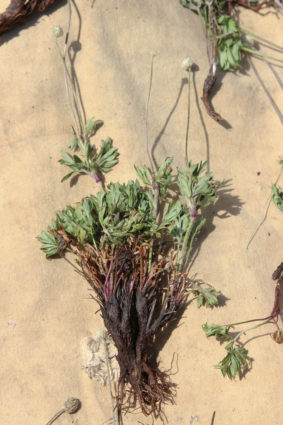 Herbaceous-a plant that dies back to the ground each year. Inflorescence-a flower or group of flowers. 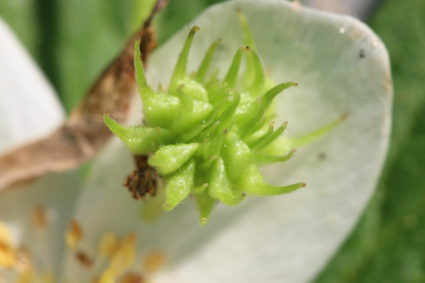 Infructescence-the fruiting part of a plant. Involucre-a structure that subtends the inflorescence. Peduncle-the stems holding the flowers. Perennial-plants that live for two or more years. If they die back to the ground each year it is an herbaceous perennial. 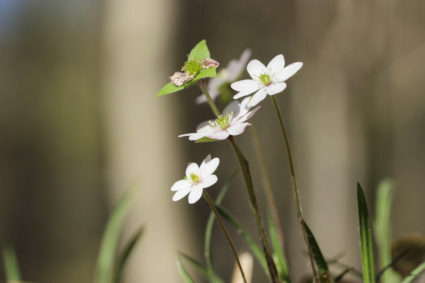 If it is woody with new parts growing on the aboveground structure, it is a woody (non-herbaceous) perennial. Receptacle-the part of the plant that subtends the flower (and later the fruits). Species-a grouping of plants that share reproductive compatibility. Subtends-a part that sits below another part. For example; the neck subtends the head and the shoulders subtend the neck. Symmetrical-a flower that can be divided into four equal parts. Anemone (Pulsatilla) patens. Rocky Mountains.